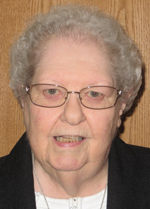 Sister Rosemary McGowan, 85, of the Bernardine Franciscan Sisters Third Order Regular of St. Francis, died May 10 at St. Joseph Villa, Reading, where she had resided since 2016. Born in Philadelphia, she was a daughter of the late Vincent and Stella (Nestor) McGowan. Sister Rosemary entered the Bernardine Order on Aug. 11, 1956 and was in her 62nd year of religious life. She earned a Bachelor of Science degree in education from Villanova University and a Master of Arts in religious education from St. Charles Borromeo Seminary. She served her ministry in Maryland, Michigan and Pennsylvania as an elementary and secondary teacher, business office staff, principal, superior, administrative assistant, office assistant, receptionist, congregational offices volunteer and local minister. There are no surviving immediate family members. The funeral Mass was celebrated May 14 at Sacred Heart Convent Chapel, Mt. Alvernia, Reading. Burial followed in the Bernardine Franciscan Sisters’ cemetery, Mt. Alvernia.